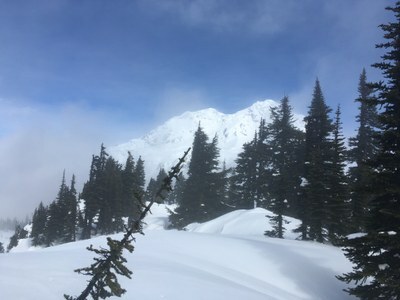 Beautiful and strenuous winter scramble with views of the SW aspect of Mt Rainier. A very wet morning with afternoon sun breaks and drier conditions (would have given this trip 5 stars with a drier morning ;). Original trip was Mt Wow, but 100% rain in morning and moderate avalanche conditions caused us to change our venue to Mt Ararat. This winter route (~12 miles and ~4100' gain) affords negligible to zero avalanche hazard by following ridge crests (a map of this route can be seen here). It begins where the normal trail reaches the stream at ~3900' and allows the added hazard of crossing this stream to be avoided. Photos from this trip can be seen here. Total trip time was ~9 hours with 5.5 hours for the ascent.